Many of us like to grow unusual plants, not only do they look great, they also have an air of wonder about them. Nature has this wonderful way of creating plants which survive in every different habitat – this is known as plant adaptation and is a natural phenomenon which has kept me hooked since the start of my career. 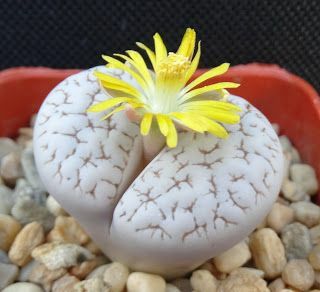 Most plants within the cacti and succulent range have adapted to survive in seemingly imperfect environmental conditions, the Living Stone Plants, botanically known as the “Lithop” are no exception and perhaps my special favourites. Their leaf and stem structure of these plants is modified, enabling them to bear the most extreme conditions and thrive. These unusual little plants are native to the dry, arid regions of Southern Africa, where they form a ground-hugging mound. Young plants initially produce just two leaves in their quest to save water. As the plants develop, fufther leaves continue to grow in pairs. Amazingly, some plants can grow for up to 25 years in the wild and double that under ideal conditions as house plants. 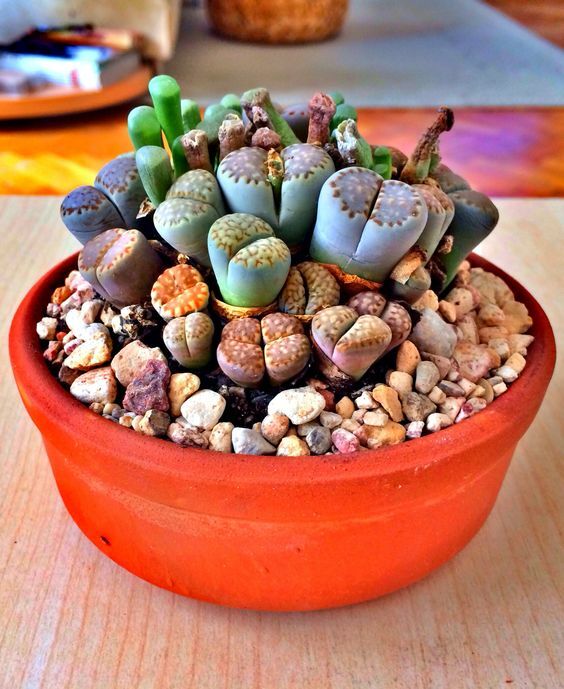 On first glance, the Lithop looks exactly as its Greek meaning suggests, “Stone Face”. Just a couple of odd-shaped stones, amongst other stones on the ground – complete with mis-colored markings. On closer inspection, however, you can just see the start of the short tapered stem and notice the texture is unlike that of a pebble. In their native African environment, these evergreen “Living Stones” mimic their natural habitat ingeniously. This not only enables them to collect as much water as possible, but will keep them safe and camouflaged from pests and grazing animals. The Living Stone Plants are part of the Ice Plant genus, Aizoaceae and are remarkably able to withstand summer temperatures of over 40 degrees C, which in my opinion, confirms they are a true warrior of the plant kingdom. 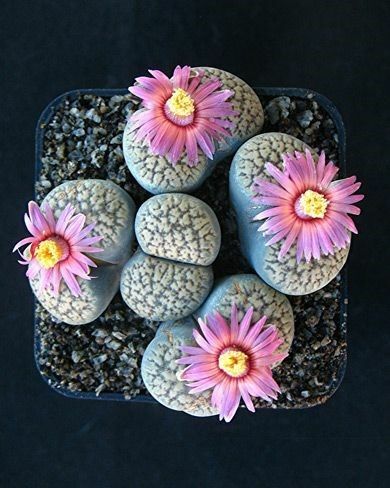 Now we’ve introduced the fabulous Lithop species, let’s delve a little deeper and learn a little more about how to grow and look after them. If you have not come across this plant species before, I guarentee you will want to own one. These small statured, evergreen succulents have fleshy, tapered, flat tipped leaves. 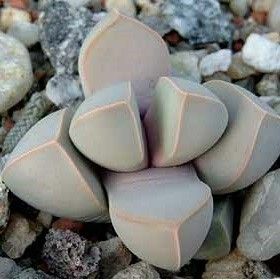 The leaves are arranged in pairs and have a deep crevice between them. This crevice is where the plant will produce a flower. 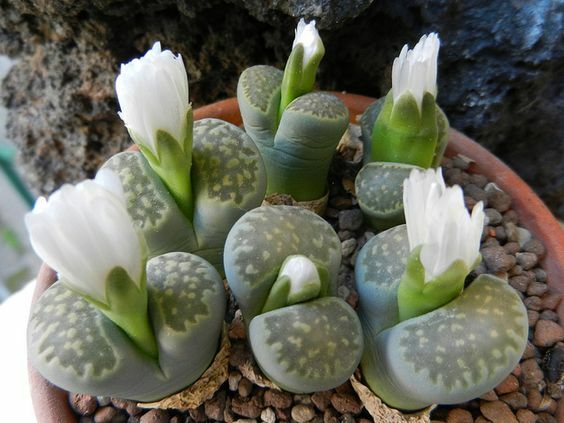 There are 37 species within the Lithop genus and a huge 145 varieties so far. These species vary in shape, colour, textures and markings, and this is the best way to identify them. All living stone plants produce flowers, natively after the seasonal rains have started. Flowering will only start in the plants third year of life. Below, I have listed a few of the most colourful and fascinating varieties, just to get you going. Why not take a look for yourself and make a list of your own favourites? As you can see from the photo’s, (Courtesy of Pinterest), there is a wide range of varieties available. Each have different coloured markings and superb daisy-like flowers on an short upright stem. Plant your seeds in a suitable seed compost with a fine texture, this can be done in the Spring time. 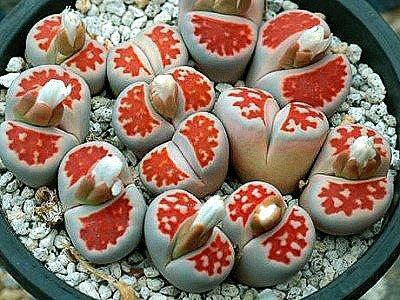 The Lithop will produce its seeds in November-December and these open naturally when it rains. They need to be wet to open, which means they are hydrochastic. Once you have a seed tray with fine compost, sprinkle on your seed and keep the tray moist. You do not need to cover your seeds as this will hamper germination. 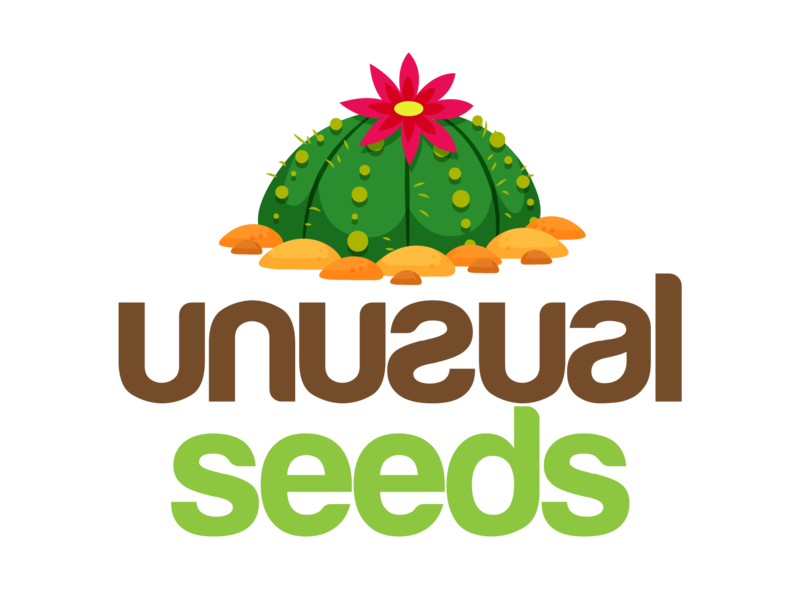 Ensure to keep your seeds at a temperature between 19 – 21 degrees C.
Once your seedlings are strong enough, transplant them into small individual pots filled with a suitable succulent compost. (I have a good recipe for this on the blog). 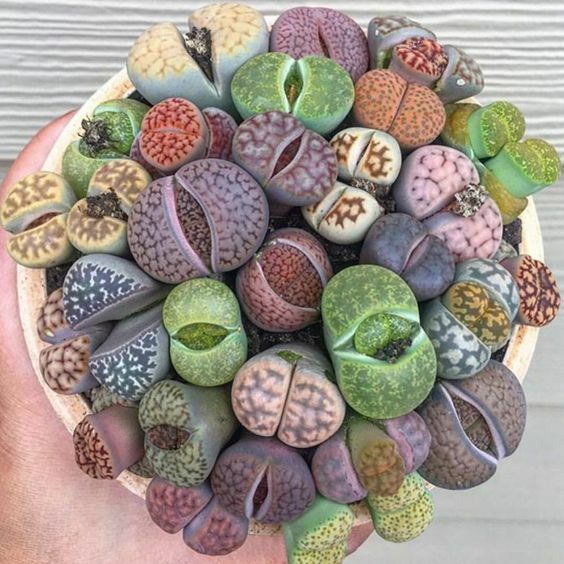 All Lithop species like to be placed in a bright, well-lit location. Ideally, they need to receive between 4 – 5 hours per day of intense sunlight. You can tell if your plant is suffering from too little light by checking how it is growing. If it is more tall and slim, than short and round it may need more light. They also tend to lean one way instead of growing upright. 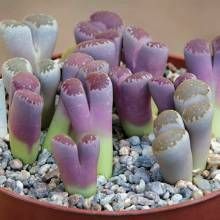 Should this be the case, move your Lithop plant to a brighter location. 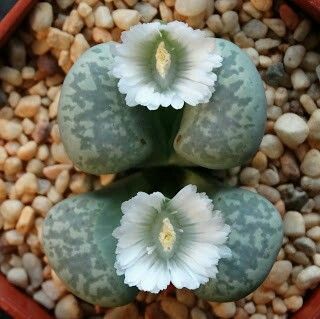 A south or east facing sheltered site is ideal and will keep tour Lithop happy. 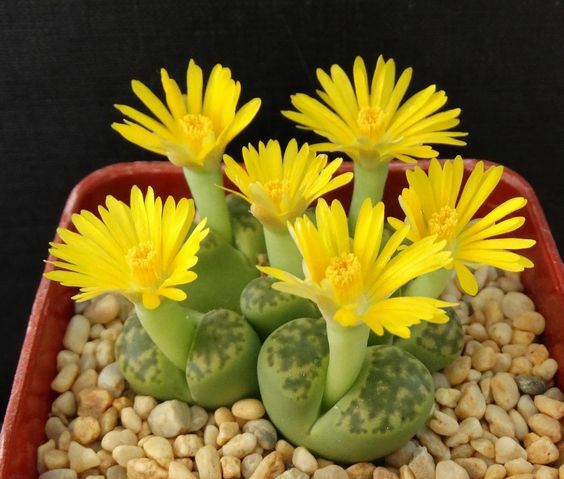 Due to their native origins, the Lithops plants have adapted to needing very infrequent water and low humidity. It is best to give your plant a good drink, and let it dry out completely before re-watering. When the plant is in growth mode, (throughout the summer months), you will need to water moderately. In the winter time, try to keep your Lithop pretty dry. 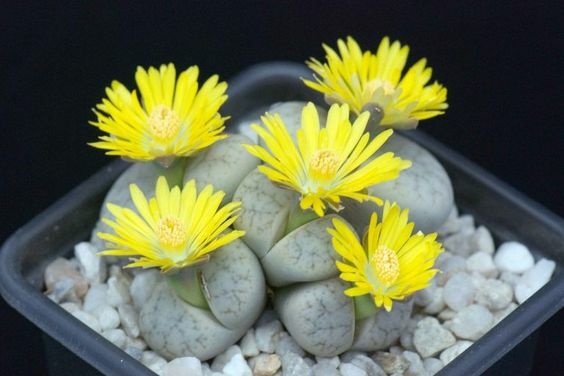 It is important to feed your Lithop in the summer growing season. I would recommend using a suitable, diluted,liquid feed every two to three weeks. Feeding the plant will help in its daisy-like flower production. 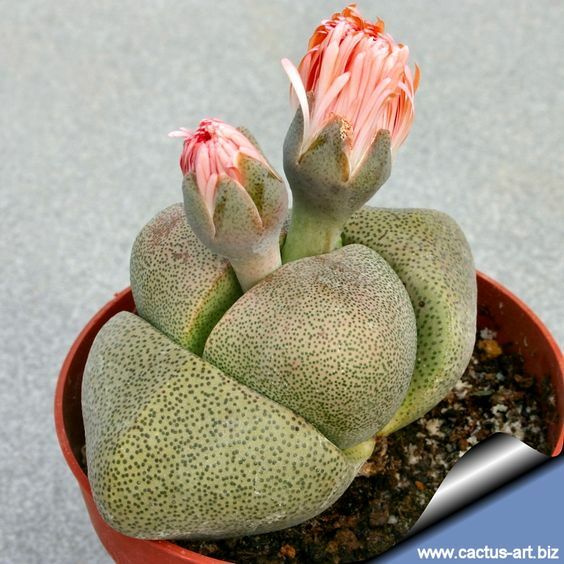 As discussed above, you can propagate your favorite Lithops from seed, as sold on our Unusualseeds.net website. Alternatively, you can propagate by using offsets from a mother plant. You could use the succulent compost recipe for potting the offsets on, if you feel inclined. There are only two pests which spring to mind that could cause problems for your Lithop plants, these are Aphids and Mealybugs. Should you have a pest problem, spray your plant with a suitable pesticide available from your local garden centre. Good news gardening folk, there are no diseases which the Lithop specifially suffers from. Most of the problems people have are due to over-watering and lack of sunlight. Enjoy browsing the website to see what other rare beauties we have to offer.